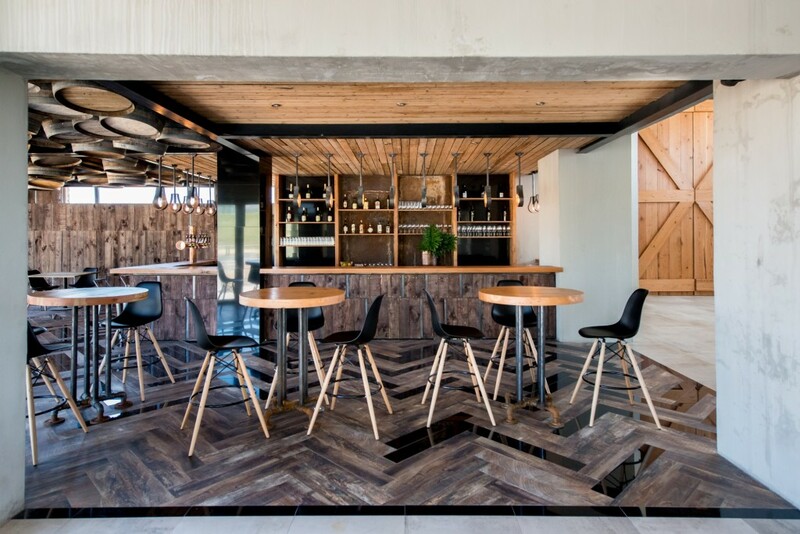 Having already created the heady contemporary space for the wine farm’s restaurant and brewery, Wagon Trail, it was unsurprising that Inhouse Brand Architects was commissioned to design the new building’s interiors. Inhouse was directed by the client to connect the style of the existing restaurant with that of the events space. Set to host a wide range of functions such as weddings, launches and conferences, it was essential that a stylish and inclusive aesthetic was chosen, forming a neutral backdrop for any function. Creative director, Aidan Hart, and senior designer, Brenda Hart (both of whom had previously headed the Wagon Trail project), opted for neutral colours to contrast the venue’s high ceilings already clad by the client in solid Oregon pine. 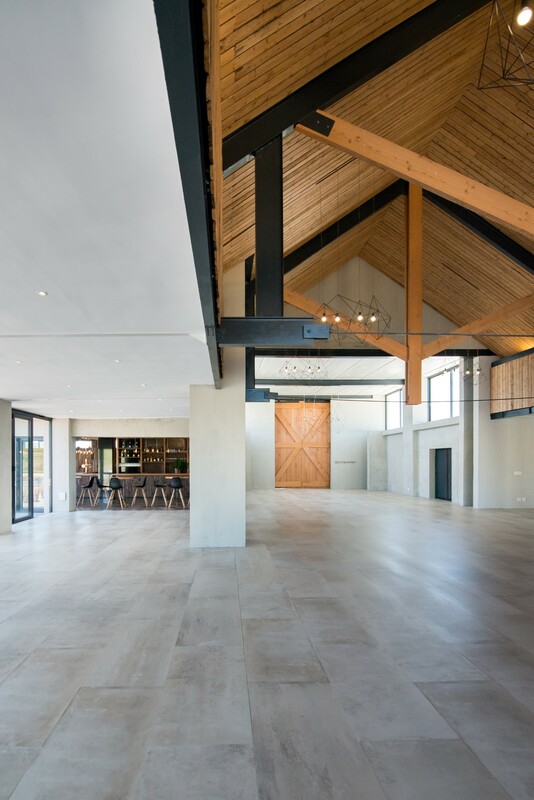 Light-colour porcelain tiles were selected for the flooring, along with a weathered-plaster paint finish, to complement the warm wooden hues and establish a distinctly modern space that hints at a conventional farmhouse. Floor-to-ceiling glass windows perfectly frame the outdoor vistas, further strengthening the contemporary feel while incorporating the best use of natural light. The choice of lighting was a challenge because it needed to suit a variety of different events. 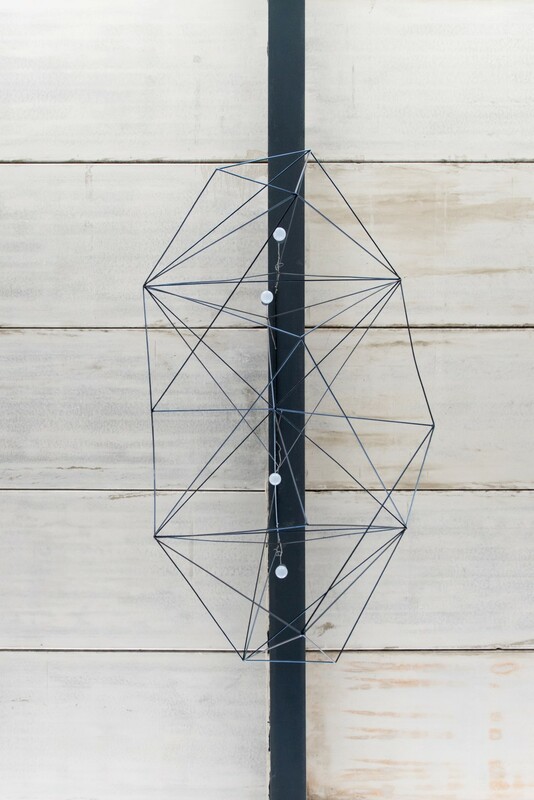 Steering away from the traditional, Inhouse commissioned local industrial designer, Ryan Matchett, to create a series of modish, steel pendant feature lights. These are suspended over the entire venue, providing well-balanced light throughout. The bathrooms encompass the modern-rustic aesthetic that is already evident in the space. Brass pendant lights and taps, as well as angled mirrors, produce a countrified look-and-feel. This is cleverly juxtaposed with black mosaic-wall tiles, which contribute to a more contemporary appearance. Wood tiling in the bathrooms was used, offering practicality and warmth. Adjoined to the main venue is the beautifully conceived Cooper’s Bar. Inspired by the craft of barrel-making, as the name suggests, the interior conveys a sense of the wine farm’s heritage. Representing a cooper’s yard, dozens of refurbished barrels hang from the ceiling and pay tribute to this unique craft. To reinforce the concept, wooden panels imitating deconstructed wine barrels were used to clad the bar, while metal hoop lights were suspended overhead. A solid piece of Oregon pine forms the bar counter, accompanied by bar stools fashioned from steel and wood. Wood is unquestionably the central element of the design – casing practically everything in the room. Rusted metal sheets cover the back of the bar, adding to the rustic feel. In addition to this, old piping was repurposed as leg stands for the high tables that occupy the space. A notable design feature includes black, high-gloss porcelain tiling which has been laid alongside porcelain wooden tiles in a herringbone pattern. By mixing these opposing materials, Inhouse was able to produce an uber-chic yet relaxed environment. 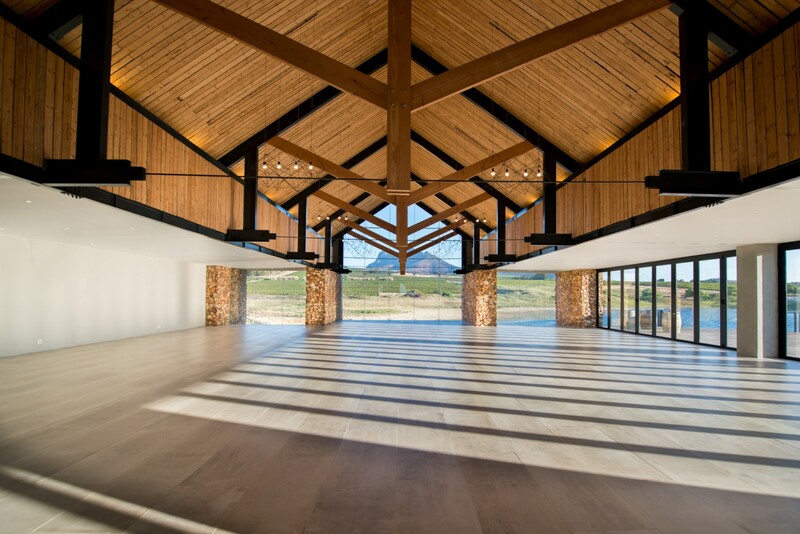 Anura Vineyard’s new events venue showcases how an upmarket, contemporary aesthetic can still stay true to wine farm culture and traditions. Carne X 2 = double the delight! New Carne on Kloof, designed by Inhouse Brand Architects, extends the original Carne on Keerom to a wider audience.